WASHINGTON — My favorite part of the ethics report on Charlie Rangel involves his efforts to "close" a $10 million gift "to create AIG Hall" as part of the Rangel Center at the City College of New York. 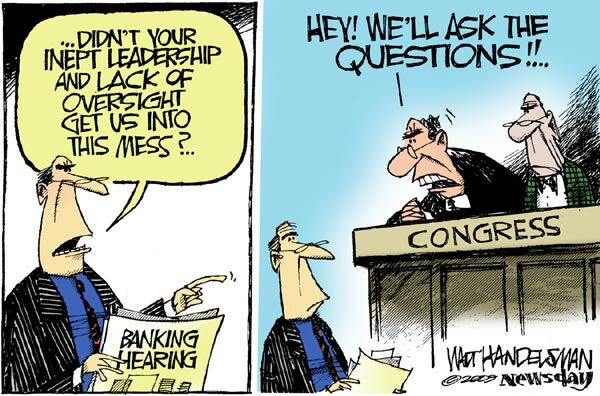 At a meeting in April 2008, the New York Democrat, then the chairman of the House Ways and Means Committee, "asked AIG, at least twice, what was necessary to get this done," according to the report. The insurance giant wasn't so sure about writing the check, citing the "potential headline risk." When AIG — the company that paid out hundreds of millions in bonuses after being rescued by a government bailout — recognizes an appearance issue, you know you've got a problem. Unless, that is, you're Charlie Rangel. Or, for that matter, Maxine Waters, the California Democrat who this week joined Rangel in being charged with ethics violations and awaiting a public trial by the House ethics committee. Which gets to my favorite part of the ethics report on Waters. Fast-forward a few months after Rangel's meeting with AIG, to the first weeks of September 2008. This was, to put it mildly, a busy time for then-Treasury Secretary Hank Paulson. The economy was tanking. Lehman Brothers was about to go down. But when a senior member of the Financial Services Committee calls, the treasury secretary tends to listen. Waters said she had "some people in town who were important to her," Paulson recalled, and asked for a meeting with Treasury officials to discuss their concerns. How important to her? As Waters told the Office of Congressional Ethics, which conducted the preliminary investigation of her activities, "You don't use your chits for nothing. You call when there is an important issue." The issue broadly involved the government takeover of Fannie Mae and Freddie Mac and its impact on minority-owned banks. But when Paulson's aides got to the meeting, they discovered that all but one of the banking industry participants were from one such institution: OneUnited. On whose board Waters' husband had served until a few months earlier. In which he continued to have investments worth between $500,000 and $1 million. A fact Waters somehow neglected to mention to Paulson — although she was most certainly aware of it. As the report notes, Waters mentioned to Congressman A — better known as Massachusetts Democrat Barney Frank — that "Sydney's been on the board." Frank twice advised Waters to "stay out of it." The obvious question is: What is wrong with these people? The tempting answer: They're members of Congress. This may sound both harsh and glib. I'm certainly not suggesting that most lawmakers are as heedless of ethics rules as Rangel and Waters appear to have been — although many members of the public appear disposed to believe so, and the seemingly endless stream of ethics revelations reinforces this misperception. But there is something in the congressional atmosphere of compliant aides and fawning courtiers that enables and encourages their sense of ordinary-rules-don't-apply-to-me entitlement.